The release of Magic's newest set, New Phyrexia, is just one month away. With the Gigeresque Phyrexians winning their war against the Mirrans, the set is sure to be dark and dripping with Phyrexian infection. Check out this gallery of New Phyrexia art, including a couple of exclusives. In Magic's storyline, the Phyrexians and the Mirrans have been at war through all three expansions in the current "block": Scars of Morridon, Mirrodin Beseiged and New Phyrexia. This block revisits an old setting for the first time in Magic history, returning to Mirrodin after 2003's Mirrodin, Darksteel and Fifth Dawn sets. Wizards of the Coast remained coy about the war's eventual victor, referring to New Phyrexia as its development code name, "Action," and even putting out mock booster display boxes featuring the alternate name if the Mirrans had won: "Mirrodin Pure." 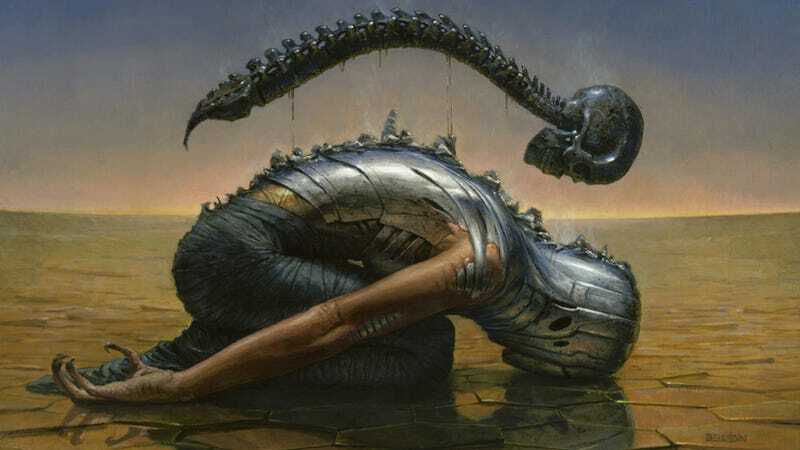 One of the main themes during the war has been the Phyrexian infection, which they use to convert those they encounter into twisted, Phyrexian versions. Mechanically, this manifests in the Infect creature ability, which offers an alternate win condition by poisoning your opponent to death. That the infection has spread through all five colors is pretty obvious looking at the card art. The two exclusive pieces of art featured here are second and third in the gallery, starting with the art for Parasitic Infection. Looks like one of the robotic Myr creatures has a bit of the old infection. After that is alternate, full size art for Surgical Extraction, a powerful card that uses another new game mechanic called Phyrexian mana. Coming in all five colors, Phyrexian mana can be paid for as normal or by paying two life. New Phyrexia looks like a pretty exciting set with some seriously disturbing art. Don't forget to hit "Expand" to see the full size (especially for Surgical Extraction, which is kind of hidden otherwise) — we scored hi res versions of the art so you can see them in all their glory.